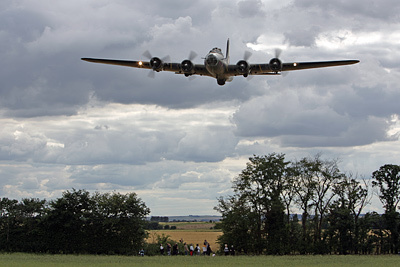 Located West of Duxford village, just off junction 10 of the M11, about 8 miles South of Cambridge in Cambridgeshire, Duxford is the UK's warbird mecca, home to the Imperial War Museum and a number of private warbird operators. 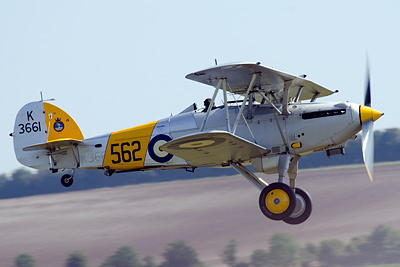 Well, warbirds! 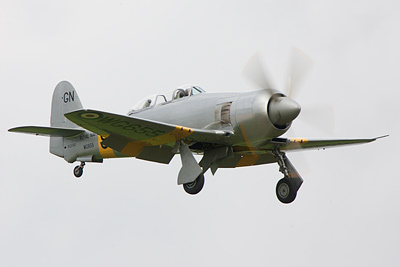 Besides the many static airframes on display in the museum, there are a large number of warbirds which regularly have engine runs or brief flights, often including display practices. A variety of civilian visitors pop in from time to time and the occasional military visitor makes a brief stop here too. Activity during the week varies with the season and weather - precious old aircraft don't get risked in poor weather, and the winter is traditionally the maintenance period with many of the residents lying around in bits in hangars 2 and 3. B-17 low pass (taken from near point A); author I'll start off right away by saying that viewing from outside the airfield's confines is not great unless you're really into some hefty hiking across fields. The M11 rules out any possibility of viewing from particularly close to that runway end, the nearest road to the South is a large distance from the runway and the farm track running past the other end of the runway is below the level of the runway and quite a distance from the threshold, and the field between you and the fence offers no public access anyway. Assuming you've arrived via the A505 from Royston, shortly after the turn for Thriplow you'll see the farm track on your right. If you're coming from the M11, as you leave the 40 mph limited area by the airfield you'll see the farm track on your left. Be warned that the potholes and mud on this track can be ferocious so you may prefer to take the small road further to the West instead, if you're not interested in getting photos down here. Around a third of the way down this track (A) you're in line with the runway. Unfortunately there is no access to the airfield boundary as there's a field in the way, but from the track you have a good view of aircraft approaching if 06 is in use, and can get passable shots of aircraft taking off from 24 - though they're normally quite high so it's undersides only normally. This track is normally closed off during airshow days, though still accessible on foot or with a bike; in fact this is the best way to go along here, as there is no room to park your car. Continuing along the farm track you'll come to a T junction. Turn left and you'll pass some trees and a farm. Keep going and you'll soon see the airfield to your left. There are a number of places along this road where you can pull off, including point B by an entrance. From here you have a good view down over the airfield, but it's a long way away. Forget taking pictures, but logging serials might be possible with a good scope and non-hazy weather. On airshow days visting aircraft are parked on this side of the airfield, much closer than they would be normally but still not close enough for photos. However, the downwind part of the landing circuit is nearly overhead so you will get aircraft passing at a closer distance (and of course running in to display overhead). A walk down into the field, farmer permitting, can get you closer (C). If an aircraft is displaying, they tend to turn for a run-in overhead near here so some excellent photo opportunities do present themselves but generally speaking you need a very large lens - or wait for a large aircraft! Walking closer to the airfield can be possible depending on the state of the fields here, and whether the farmer permits it, but there is a risk factor as you would be directly under the display area. If you do choose to take the risk, please don't leave any litter or cigarette butts - and you may be moved on. 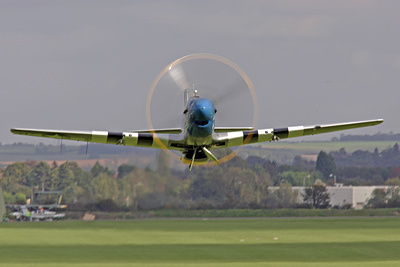 Sea Fury on final approach (taken from near point D); author Now drive into Duxford village; you'll come to a crossroads, take a left to go towards the A505. There are a few rough spots off the side of the road on the left (e.g. D) where you can pull off and there's also a public footpath that can get you closer to the M11, and therefore the end of runway 24 if you go round the field edge (E). Just be aware this is not the safest place to be and at least two accidents have resulted in debris or a complete aircraft ending up in this field. From the road you normally won't get any decent photos as the circuit is pretty tight to avoid Duxford village, but occasionally something will come in from further away so there is the outside chance of some passable photos. A no parking zone all the way along this road is in force during airshow days, but Duxford School (just on the left not far into the 30 zone if you go back towards the village) normally have parking available at these times and it isn't that far a walk back to this road. Giving up on this spot, it's time to go into the museum itself. Continue on the road and turn left at the T junction to join the A505 again. From the IWM carpark you have a limited view of anything parked outside hangar 2 but it's a dead loss for viewing any flying. Now it's time to get your wallet out, and pay to enter the museum. If you think there's any chance of you visiting the place more than a couple of times a year, then becoming a member of the Friends of Duxford is highly recommended - it's a reasonable price to join, and as a Friend you don't have to pay to enter, so you can go as often as you like. You also get reductions in the museum shop, cheaper airshow tickets and a private enclosure at airshows. 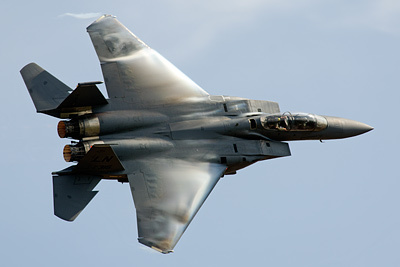 F-15E displaying (taken from point F); author Once in the museum walk out of the shop area and towards the airfield fence. To your left there are some small hangars and over here is your best spot for aircraft on approach to runway 24. The paved runway is quite far away but many aircraft use the grass runway, which is much closer, so you can get decent shots of them landing from here (F), or indeed anywhere along the fence here. 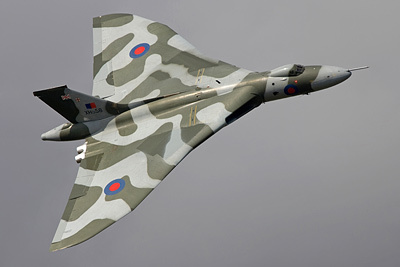 This can also be a superb place to watch the airshows from, as many aircraft will turn tightly to join the main display axis presenting their topsides to you - and as the afternoon wears on the sun will be in your favour. Larger aircraft and jets invariably use the paved runway, and as there is a taxiway leading from here ot the runway, they'll taxi straight out to the runway at this end if 24 is in use. If 06 is in use aircraft taxi off here towards you giving some great photo opportunities. Moving further along the flightline towards the control tower you have plenty of uncluttered photo opportunities on any aircraft parked up. On airshow days there is often a flightline walk facility, where you can pay to go past the fence and walk along the taxiway for closer photos. Once flying begins anywhere along the flightline is great for photos of aircraft taxiing though the aircraft parked opposite you make any view of the runway patchy at best and the sun will be in your face in the morning and early afternoon. Just past the control tower the taxiway widens out into a large pan where aircraft are parked (G). Helicopters tend to land close to the tower and this is a good spot to get photos from as long as the time of the day doesn't mean the sun is in your face. Modern military visitors are very rare but they do pop by from time to time for fuel. Mustang taking off (taken from point H, haircut intact); author For the final spot just keep on walking past the American Air Museum towards the Land Warfare Hall. Instead of going into the Hall, walk over the railway line to your left and towards the raised bank (the 'Tank Bank' as it is known). The fenceline curves to follow the taxiway here and this gets you as close to the paved runway as you're going to get (H). There's also the grass bank just back from the fence to get you further above the level of the fence. If aircraft are taking off from the grass towards you, you can get some dramatic shots from here, and any landing on the grass at this end will also give you superb shots. Any aircraft using the paved runway taxi past within feet of you and should give you some decent photo opportunities when landing, though they may be a bit high by the time they get to you if beginning their takeoff roll from the 24 end - usually it's great for photos though, particularly on airshow days when tailchase sequences roar in almost directly overhead. It can get very busy though with limited room to swing a big lens! As you've seen Duxford offers excellent viewing opportunities to paying visitors and once inside you're hardly in need of a guide to the best viewing areas, so this particular guide has been more to give those who've never visited Duxford an idea of what they're missing! 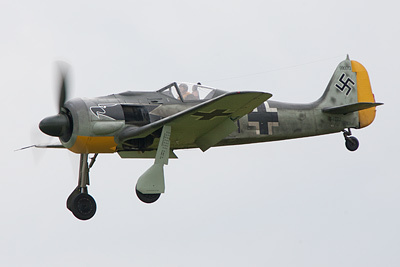 There are good photo opportunities to be had in the fields on the other side of the runway on sunnier days but these require the farmer's permission and a LOT of walking (the nearest place to park is Duxford village or the IWM itself); they are also risky, being directly under the display axis. Petrol available from a garage on the North side of the A505 West of the IWM entrance, or further East on the A505 where there is also a McDonalds. Two cafes within the IWM, but they are expensive and the food is not particularly good. You'd be better off exploring Duxford village for a decent pub.